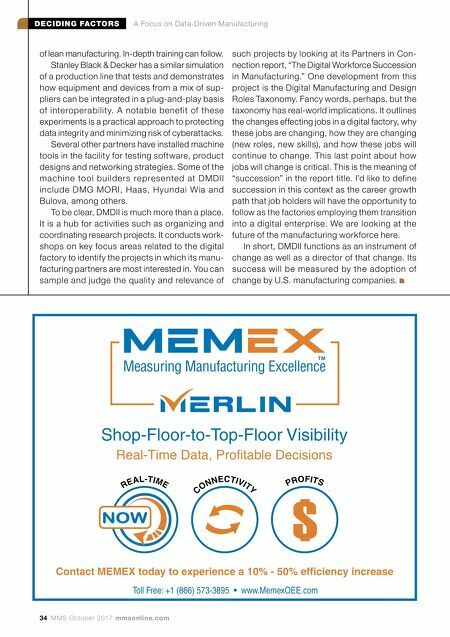 34 MMS October 2017 mmsonline.com DECIDING FACTORS A Focus on Data-Driven Manufacturing of lean manufacturing. In-depth training can follow. Stanley Black & Decker has a similar simulation of a production line that tests and demonstrates how equipment and devices from a mix of sup- pliers can be integrated in a plug-and-play basis of interoperabilit y. A notable benefit of these experiments is a practical approach to protecting data integrity and minimizing risk of cyberattacks. Several other partners have installed machine tools in the facility for testing software, product designs and networking strategies. Some of the machine tool builders repre se nted at DMDII include DMG MORI, Haas, Hyundai Wia and Bulova, among others. To be clear, DMDII is much more than a place. It is a hub for activities such as organizing and coordinating research projects. It conducts work- shops on key focus areas related to the digital factory to identify the projects in which its manu- facturing partners are most interested in. You can sample and judge the quality and relevance of such projects by looking at its Partners in Con- nection report, "The Digital Workforce Succession in Manufacturing." One development from this project is the Digital Manufacturing and Design Roles Taxonomy. Fancy words, perhaps, but the taxonomy has real-world implications. It outlines the changes effecting jobs in a digital factory, why these jobs are changing, how they are changing (new roles, new skills), and how these jobs will continue to change. This last point about how jobs will change is critical. This is the meaning of "succession" in the report title. I'd like to define succession in this context as the career growth path that job holders will have the opportunity to follow as the factories employing them transition into a digital enterprise. We are looking at the future of the manufacturing workforce here. In short, DMDII functions as an instrument of change as well as a director of that change. 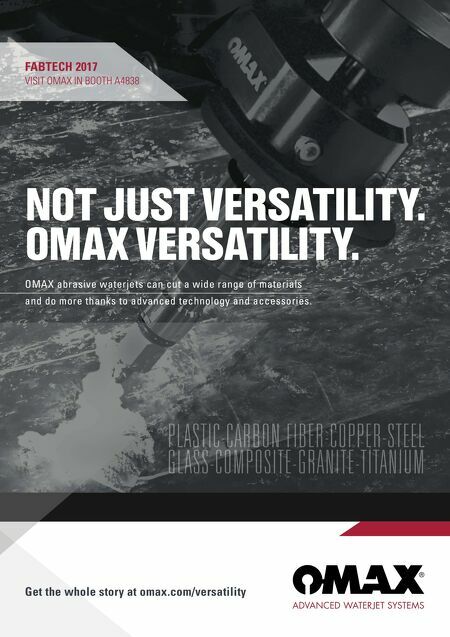 Its success will be measured by the adoption of change by U.S. manufacturing companies.